04 Aug 2018 : Ist Year B.Tech Time table for I semester AY 2018 - 2019 for all sections. 24 Jul 2018 : Induction Program for First Year B.Tech Students (23rd July to 4th August, 2018). 09 Jul 2018 : Fee structure for DASA students of I B.tech 2018 - 19. 01 May 2018 : JEE MAIN 2017 Opening & Closing Ranks at NITW. 22 Jan 2018 : Rules and Regulations of Bachelor of Technology (B.Tech) Program (With effect from 2017 - 2018). 11 Jul 2017 : Instructions to students joining B.Tech program under DASA scheme. 07 Jul 2017 : Fee structure for DASA/ICCR students of I B.tech 2017-18. 21 Jun 2017 : Instructions to B.Tech 1st Year students to be admitted to NITW through JOSAA. 15 Jun 2017 : change of commencement of class work for 1st B.Tech, 1st M.Tech and 1st M.C.A - reg: The commencement of class work for 1st B.Tech, 1st M.Tech and 1st M.C.A. students is from 24/7/2017. 14 Jun 2017 : List of students who got change of branch - with effect from the Academic Year 2017-18. 05 Jul 2018 : Instructions to the M.Tech(National Spot Round) candidates taking admission through CCMT-2018. 06 Jun 2018 : PG Fee structure for the Academic Year 2018-19. 24 Jul 2017 : Instructions to students taking M.Tech admission in NSR through CCMT2017. 20 Jun 2017 : Fee details of other semesters for PG students admitted in July 2017. 16 Jun 2017 : Instructions for M.Tech students reporting at NITW from 26th to 29th June 2017. M.Tech (CCMT 2016) candidates allotted to NIT Warangal. 22 Feb 2018 : NIMCET-2018: For admission into MCA for the academic year 2018-19. 05 Jul 2017 : Instructions to candidates seeking M.C.A admissions, July 2017 session. 12 Jul 2018 : Spot Round for MBA Admissions for the Academic Year 2018-19. 04 May 2018 : List of candidates called for the Third Round of Counselling for MBA-2018 Admissions. 16 Apr 2018 : List of candidates called for the Second Round of Counselling for MBA-2018 Admissions. 27 Feb 2018 : List of candidates shortlisted for Group Discussion and Interview for admission to MBA-2018. 06 Jul 2017 : Last round counseling for MBA Admissions July 2017 session. 28 Apr 2018 : CCMN 2018: Students aspiring for M.Sc. admissions in various NITs and qualified in JAM can visit www.ccmn.in to register for comon counseling. Registration in the portal has commenced. 02 Oct 2017 : "Admissions into various MSc programs at NITW for 2018 academic year wil be based on JAM 2018 test being conducted by IITB. (jam.iitb.ac.in). Hence the aspirants for MSc program at NITW are required to register and take part in JAM 2018." 30 Jun 2017 : Instructions to the students joining into M.Sc. program. 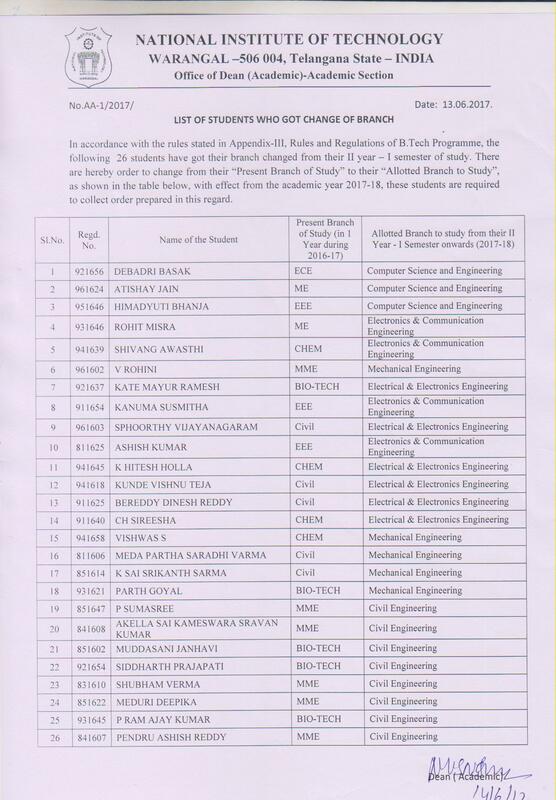 CCMN 2016 Candidates allotted to NIT Warangal. Note: Admission will be based on JAM score. Candidates are informed to follow the website www.ccmn.in for further details and registration. 10 Oct 2018 : "Ph.D. admissions December 2018. Application format online is available from 12th October 2018." 12 Jun 2018 : PhD Admission in Civil Engineering Department- July 2018 Session, Syllabus for Written Test for selecting candidates for Interview (Oral Exam). 04 Jun 2018 : List of candidates shortlisted for written test and interview for Ph.D. Admissions, July 2018-19. 01 Dec 2017 : Instructions to candidates selected for Ph.D admissions December 2017 Session. 29 Nov 2017 : List of candidates selected for Ph.D admission for Dec 2017 Session – Part Time, Full Time, JRF category. 14 Aug 2017 : Rules and Regulations of Ph.D program (with effect from 2017 - 2018). 23 Jun 2017 : Instructions to students taking ph.d admission for July 2017 session. 09 Jun 2017 : Phd.Admissions - July 2017 session - Department wise schedule of reporting for written test and Interview. 06 Jun 2017 : Ph.D admission for July 2017 session Department wise shortlisted candidates for written test/ interview. 03 Jun 2017 : Ph.D. Admissions July 2017 - Proposed schedule of Ph.D Interviews and Written Test. 02 Jun 2017 : list of shortlisted candidates for Ph.D. in various departments for July 2017 session. 24 June 2016: Provisionally Selected for Ph.D Admissions into various Departments, July 2016. PhD admissions July 2016 - Instructions to the candidates. PhD admissions July 2016 Shortlisted candidates.